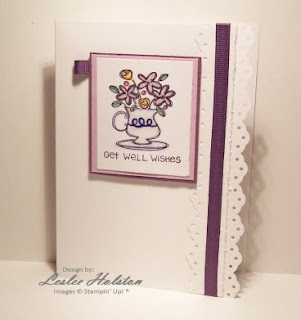 This card is super simple to make! The image is simply colored using SU! markers and matted onto coordinating card stock. I punched the outside edge using SU! 's Eyelet Border punch. I, also, punched a strip of card stock and distressed the straight edge. 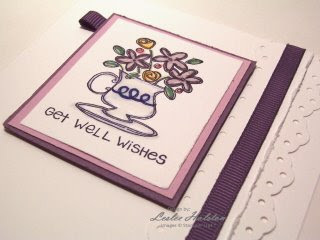 Added the coordinating ribbon and adhered it all to the card base. For added interest, I used Crystal Effects to give some dimension to the teacup and saucer and a few flower centers. Like I said, super simple! Here is the same layout turned 90 degrees. Each of these images are from the Fun & Fast Notes set. This set contains eight different images and occasions. A set that has lots of bang for the buck (gotta love that kind of set)! 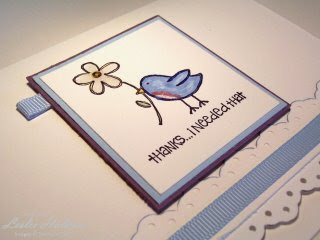 If you are interested in purchasing or checking out more of what Stampin' Up! 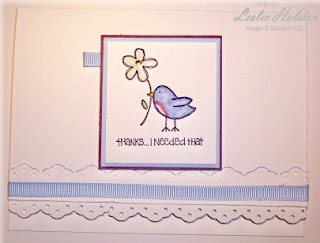 has to offer, click here to check out my Stampin' Up! Website. You can shop from there. Thanks for stopping in today. I hope you've been inspired to make a Fun & Fast Card!